Our crazy shifts are gradually starting to take their toll. We are all increasingly spending our days off catching up on sleep instead of going to see the local attractions. Yesterday my day began with a scene that captured the mood among the volunteers very well. I saw a British colleague sitting on a low fence at a bus stop. The only bit of the Olympic uniform he was wearing was the hat. He was fidgeting with a bottle of water and staring blankly into the middle distance. Several buses passed him by, but he didn’t seem to notice. It was a Monday morning, with all the burdens that entails. I have lately been having this strange feeling that life all around me has somehow slowed down. Olympic Park visitors are now plodding tiredly from one venue to the next instead of dashing madly to and fro, as they did during the first few days. Even the freebies distributed by the sponsors no longer generate much excitement; people seem more interested in hot dogs than Olympic souvenirs. Cafes are filling up while stadiums look empty. 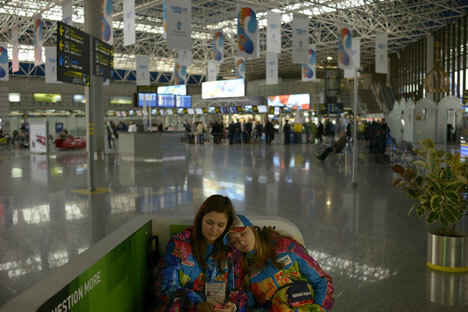 Olympic staff and volunteers alike are now taking all a crisis that a week ago would have caused a major panic with calm stoicism: “Five people haven’t shown up for their shift due to sickness? Well, the other two have, so we'll just make do with what we have." Even the Olympic transport seems to have slowed down, with longer intervals between the buses. I’m having to resort to all sorts of tricks just to be able to get to my bed at 4 a.m. after the late shift without either falling asleep right at the bus stop or having to pay $20 for a taxi. Everyone is really tired, but it does not mean that everyone has lost interest in the Games – far from it. The atmosphere at the events is just as electric and unforgettable as it was during the first days. Thousands of spectators are still screaming in unison and pouring out their emotions. This is an integral part of the Games, and it’s not going to change as long as the Olympic flame is still burning. It’s just that people sometimes need to sleep, regardless of our latest Olympic triumphs.